For other uses, see Dillo (disambiguation). Dillo is a minimalistic web browser particularly intended for older or slower computers and embedded systems. It supports only plain HTML/XHTML (with CSS rendering) and images over HTTP; scripting is ignored entirely. Current versions of Dillo can run on Linux, BSD, OS X, IRIX and Cygwin. Due to its small size, it is the browser of choice in several space-conscious Linux distributions. Released under the GNU General Public License, Dillo is free software. Chilean software engineer Jorge Arellano Cid conceived the Dillo project in late 1999, publishing the first version of Dillo in December of that year. His primary goal in creating Dillo was to democratize access to information. Arellano Cid believed that no one should have to buy a new computer or pay for broadband in order to enjoy the World Wide Web. To this end, he designed Dillo to be small, fast, and efficient, capable of performing well even on an Intel 80486 CPU with a dial-up Internet access. Dillo was originally written in the C programming language with the GTK+ GUI toolkit. The first versions were based on an earlier browser called Armadillo, hence the name. Dillo 2, written with both C and C++ components and the Fast Light Toolkit (FLTK), was released on October 14, 2008. Text antialiasing, support for character sets other than Latin-1, HTTP compression capability, and improved page rendering were all added. The move to FLTK from GTK+ also removed many of the project's dependencies and reduced Dillo's memory footprint by 50%. In 2011, Dillo-3.x was released, using FLTK-1.3. According to the Changelog, this change was prompted in part by the lack of an official release of FLTK-2, which stopped Dillo-2's inclusion in lightweight distributions for which it would otherwise have been suitable. Jorge Arellano Cid is still Dillo's lead developer today. Dillo is funded by private donations; efforts to obtain public grants and corporate sponsors have been unsuccessful. Lack of funding led to a slowdown in development in 2006, and a complete stop in 2007. The project restarted again in 2008 and two months later received a €115 donation from DistroWatch. Features of Dillo include bookmarks, tabbed browsing, and support for JPEG, PNG (including alpha transparency), and GIF images. Partial support for CSS was introduced in release 2.1. Settings such as the default fonts, background color, downloads folder, and home page are customizable through configuration files. Cookies are supported but disabled by default due to privacy concerns. While most web browsers retain the web cache and history after the program is closed, Dillo automatically clears them to improve both privacy and performance. A developer tool called the "bug meter" is provided in the lower-right corner. When clicked, it displays information about validation problems, such as unclosed tags, that Dillo found in the web page. Unlike most browsers, Dillo does not have a quirks mode to improve compatibility with web pages that use invalid HTML. Instead, Dillo processes all web pages according to the published web standards. Reviews of Dillo have praised its extraordinary speed, but noted that this speed comes at a price. The most visible cost is Dillo's inability to display complex web pages as they were meant to be. 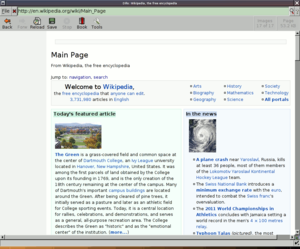 A 2008 review by Linux.com commented that Dillo's user interface may be "intimidating" for new users, and pointed out the scarcity of plug-ins for Dillo. In all, Dillo's global usage share is less than one hundredth of one percent. Many of these deficiencies can be attributed to the simple lack of manpower behind development. Dillo is, however, the browser of choice in several space-conscious Linux distributions, such as Damn Small Linux, Feather Linux, VectorLinux, antiX and Mustang Linux. ^ Arellano Cid, Jorge (2015). "ChangeLog". www.dillo.org. Retrieved 2 July 2015. ^ a b c Wayner, Peter (19 October 2010). "Top 10 specialty Web browsers you may have missed". InfoWorld. p. 3. Retrieved 28 October 2010. ^ Arellano Cid, Jorge (1 July 2002). "Introducing Dillo, a lightweight embeddable browser". LinuxDevices.com. Archived from the original on 2009-03-09. Retrieved 14 February 2009. ^ a b "Dillo Web Browser :: Compatibility". University of Bremen. 16 November 2008. Retrieved 13 February 2009. ^ a b c d e "Dillo Web Browser :: Home Page". University of Bremen. 7 December 2008. Retrieved 12 February 2009. ^ Arellano Cid, Jorge. "Personal info for Jorge Arellano Cid". Retrieved 12 February 2009. ^ a b c Nieradzik, Tim (19 April 2009). "dillo:ChangeLog". Mercurial. Retrieved 21 April 2009. ^ Arellano Cid, Jorge (December 2002). "Cuál sería el principal uso de Dillo?" (in Spanish). tux.cl. Archived from the original on 13 April 2003. Retrieved 13 February 2009. English translation available. ^ Arellano Cid, Jorge (December 2002). "Básicamente, de que se trata el proyecto Dillo?" (in Spanish). tux.cl. Archived from the original on 13 April 2003. Retrieved 13 February 2009. English translation available. ^ Arellano Cid, Jorge (31 December 1999). "Home page (ASCII version)". SourceForge.net. Retrieved 21 April 2009. ^ "Dillo Web Browser :: Project team". University of Bremen. Retrieved 13 February 2009. ^ "Dillo Web Browser :: Donations". University of Bremen. 14 October 2008. Retrieved 13 February 2009. ^ "Embeddable browser project hits milestone release, seeks funding". LinuxDevices.org. 19 February 2004. Archived from the original on 16 February 2009. Retrieved 13 February 2009. ^ Arellano Cid, Jorge (August 2008). "Dillo is eight years old!". Archived from the original on 2012-02-20. Retrieved 12 February 2009. ^ Martin, Caitlyn (1 December 2008). "DistroWatch.com News". DistroWatch Weekly. Retrieved 13 February 2009. ^ Roelofs, Greg (17 May 2008). "PNG-supporting Browsers". SourceForge. Retrieved 13 February 2009. ^ a b c Arndt, Matthias (June 2002). "Dillo--a Web Browser as Fast as Lightning". Archived from the original on 15 February 2009. Retrieved 13 February 2009. ^ a b Byfield, Bruce (5 November 2008). "Dillo 2.0 is fast, but limited". Linux.com. Retrieved 13 February 2009. ^ "Sample dillo initialization file". University of Bremen. Retrieved 13 February 2009. ^ "Q: How do I enable cookies?". Dillo Web Browser :: Frequently Asked Questions. University of Bremen. 15 January 2009. Retrieved 11 February 2009. ^ "Dillo Web Browser :: Funding Presentation :: Advantages". University of Bremen. Retrieved 13 February 2009. ^ "Dillo Web Browser :: About Dillo's Bug Meter". University of Bremen. Retrieved 13 February 2009. ^ "Why do some pages look strange?". Dillo Web Browser :: Frequently Asked Questions. University of Bremen. 15 January 2009. Retrieved 11 February 2009. ^ "Dam(sic) Small Linux on retro hardware -- 486SX and 486DX2". John Andrews. 19 October 2003. Retrieved 24 May 2009. ^ Downloads - nanox-microwindows-nxlib-fltk-for-dos - This project ports the Nano-X, Microwindows, NXlib and FLTK 1.3.0 libraries to the DOS operating system using DJGPP - Google Project Hosting. Code.google.com. Retrieved on 2013-12-09. ^ Arellano Cid, Jorge (December 2002). "El hecho de que Dillo este programado en C hace que sea portable a otros sistemas operativos, debería Windows ser su objetivo principal, ya que la "democratización de internet" tendría más impacto debido a la cantidad de usuarios de este s.o.?" (in Spanish). tux.cl. Archived from the original on 13 April 2003. Retrieved 13 February 2009. English translation available. ^ Vibber, Kelson (13 October 2008). "Installing Dillo on Cygwin". Retrieved 13 February 2009. ^ "Project Status". Dillo-Win32. 5 December 2011. Archived from the original on 15 March 2012. Retrieved 1 January 2012. ^ "Official D+ Browser page". Retrieved 5 December 2013. ^ "Q: Internationalization and Localization (i18n & l10n)". Dillo Web Browser :: Frequently Asked Questions. University of Bremen. 15 January 2009. Retrieved 12 February 2009. ^ Krause, Ralph (26 February 2002). "Dillo, the GTK Web Browser". Linux Journal. Retrieved 13 February 2009. ^ "How do I enable the https (SSL) support plugin for dillo?". Dillo Web Browser :: Frequently Asked Questions. University of Bremen. 15 January 2009. Retrieved 11 February 2009. ^ a b c Kingman, Henry (16 October 2008). "Lightweight, Linux-compatible browser evolves". DesktopLinux.com. Archived from the original on 14 February 2009. Retrieved 13 February 2009. ^ Tatham, Paul (15 September 2002). "Linux Web Surfing - Get Armed with Dillo". Retrieved 13 February 2009. ^ "Browser Market Share". Net Applications. January 2009. Retrieved 12 February 2009. ^ "Damn Small Linux, Featured Desktop applications". John Andrews. Retrieved 11 February 2009. ^ "Feather Linux - About". BerliOS. Archived from the original on 27 January 2009. Retrieved 11 February 2009. ^ "Lesser known "mini" Linux runs from RAM". DesktopLinux.com. 25 January 2007. Archived from the original on 15 February 2009. Retrieved 13 February 2009. Wikimedia Commons has media related to Dillo.